These M36 Jackson Tank Destroyer are in private ownership but can be seen at many of the military vehicle events during the summer in Britain. 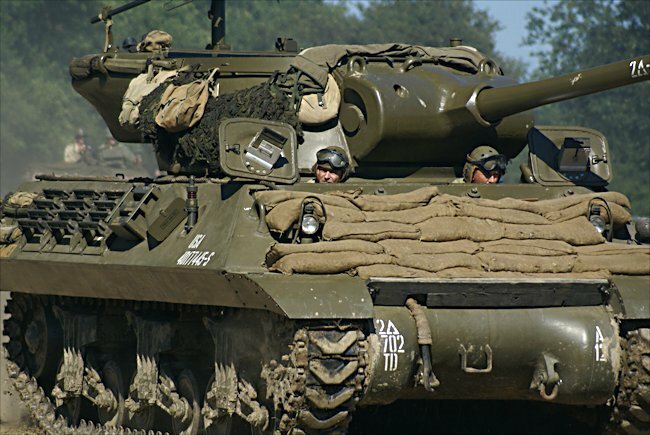 The 90mm Gun Motor Carriage, M36 was never called the 'Jackson' during WW2. It was given the nickname after the war by a model kit company and the name stuck. 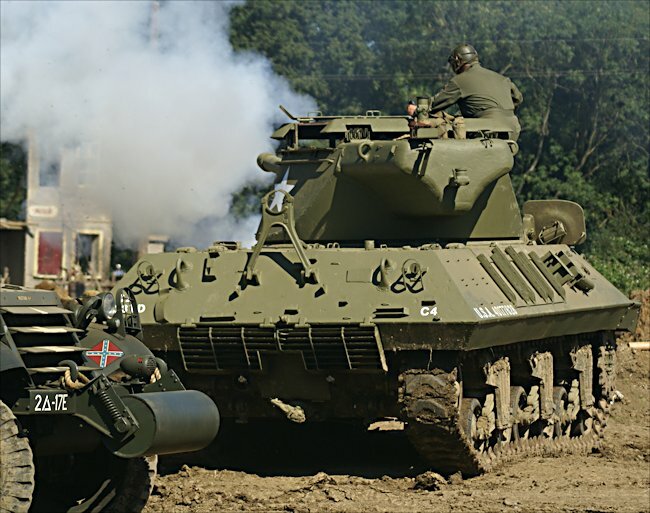 M36 Jackson TD's like the one in the front on the above photograph, with the metal turret cover is called Heavy Hitter and owned by Dave Hogarth. His TD served in WW2 from October 1944 until the end where it was shipped back to America. It was rebuilt at Red River Arsenal in September 1954. In 1991 it was sent to Yugoslavia followed by more active service in Slovenia. After it was retired it went to live in Scotland with its new owner. A total of 2,324 vehicles manufactured from November 1943 through September 1945. The US Army designation always starts with the weapon so the correct name for the M36 Jackson Tank Destroyer is 90 mm Gun Motor Carriage M36 also recorded as 90mm GMC M36. This M36 Jackson was upgraded by the Yugoslav Army and fitted with a 500HP T55 diesel engine. Finally a US Tiger Tank Killer! 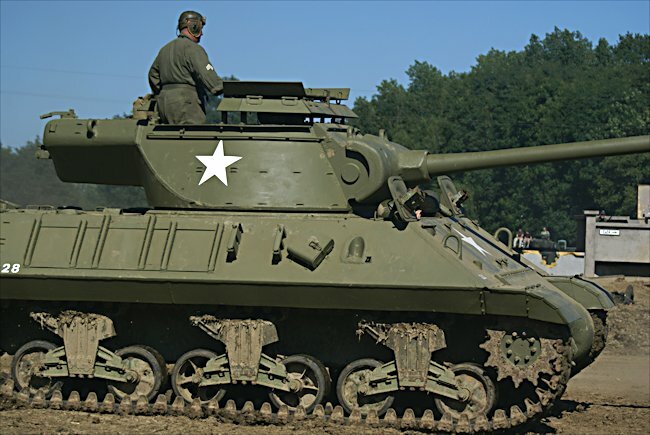 American tank designers believed that the 75 mm gun would be big enough to stand up to German tanks. This may be true for the first two years of the war, but by the time the Americans during the war the enemy armour on their tanks was thick enough to stop the shells from 75 mm gun. Penetration of these guns was not good enough. The US armaments committee ordered that the US Army Sherman tanks be supported by tank destroyers that had 90 mm guns. This new armoured weapon was called the M36. Jackson. It started service in the U.S. Army in April 1942. It saw combat in Europe in September 1944. Over 2000 of these tank destroyers were produced: 1,400 during World War II. A modified Sherman M4A3 chassis was used to construct the Jackson. Later vehicles would use the Sherman M4A3 and M4A2 chassis. The M36 used a newly designed turret with large rear overhang counterweight to balance the extra weight of the 90mm gun. The M36 Jackson's armour is weak. It was not designed to slug it out at close range with tanks. Its purpose was to speed ahead of the main attack, stay undercover shoot the first enemy tank it sees and then escape at speed before the enemy could shoot back. This tactic was called 'shoot and scoot'. It could also give support to the main advance as its 90mm L50 gun had a longer range than all the tank guns. It could hit enemy tanks at a longer distance before they got within range to fire back. It could penetrate 160 mm of armour. It was a Tiger tank killer. The folding armoured turret cover on this M36 Jackson Tank Destroyer was never used during WW2. They were added to M36 TDs used in Korea, Yugolavia, Slovinia and Bosnia. The motto of the US tank destroyers was 'seek strike destroy'. This tank destroyer was official US Army name is the 90mm Gun Motor Carriage M36. It was nicknamed Jackson after the Confederate States of America General Thomas 'Stonewall' Jackson. It was also called the 'Slugger'. They were used during the Battle of the Bulge in January 1945 when they were rushed to the Ardennes as part of a counter-attack stop the German winter offensive. It must have been very cold for the tank crew fighting in the midwinter. The turret was open topped. This enabled the tank commander better view of target the distance. It cut down on weight and gave a lower profile. It was only after the war, but a folding armoured roof kit was developed and issued to M36 Jackson tank destroyers. The large heavy counterweight on the rear of the M36 Jackson Tank Destroyer's turret was needed because of the weight and length of its 90mm L50 gun. The Jackson was only designed to engage armoured vehicles. It did not have a machine gun fitted to the front of the hull or as a coaxial gun by the 90 mm cannon. The commander had access to a 50 mm Browning M2HB machine gun the use at the top of the turret for self-defence. 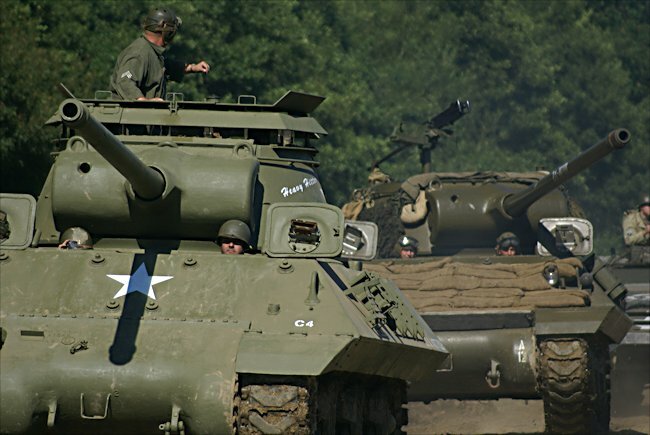 It speed was not as fast as the M10 Wolverine or the M18 Hellcat. It had a speed of 26 mph on the road. It was a lot heavier than the hellcat. The M36 weight 29 tonnes compared with the hellcats weight of this 17.7 tonnes. This was mainly because of the size of the 90 mm gun and the counterweights in the turret. Between April 1944 and July 1945 US factories prooduced 1413 90mm Gun Motor Carriage M36 Tank Destroyers. They made 187 M36 B1 varients between October 1944 and December 1944 and M36 B2724 units between May 1945 and September 1945. Where can I see more M36 Gun Motor Carriage Jackson Tank Destoyers?